Buy Teonis Cookies at The Cheese and Wine Shop! We have a great range of Teonis Cookies, from Bite size through to the ever popular Stem Ginger. 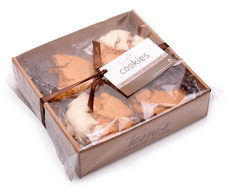 Teonis is a collection of the most wonderfully delicious, hand-made oat crunch cookies, butter shortbread biscuits and totally divine biscotti. All Teonis Shortbreads and Cookies are wonderfully delicious! All are hand made in Devon, from the best selling Oat Crunch cookies to their Bite Size range and shortbreads, which are popular all year. For a real treat, and for a special occassion, we have Teonis Chocolate Coated range, which are great gifts. Producing a wonderful range, its enhanced through the festive period, with delicious festive Cookie flavours, such as Cinnamon, Nutmeg and All Spice.